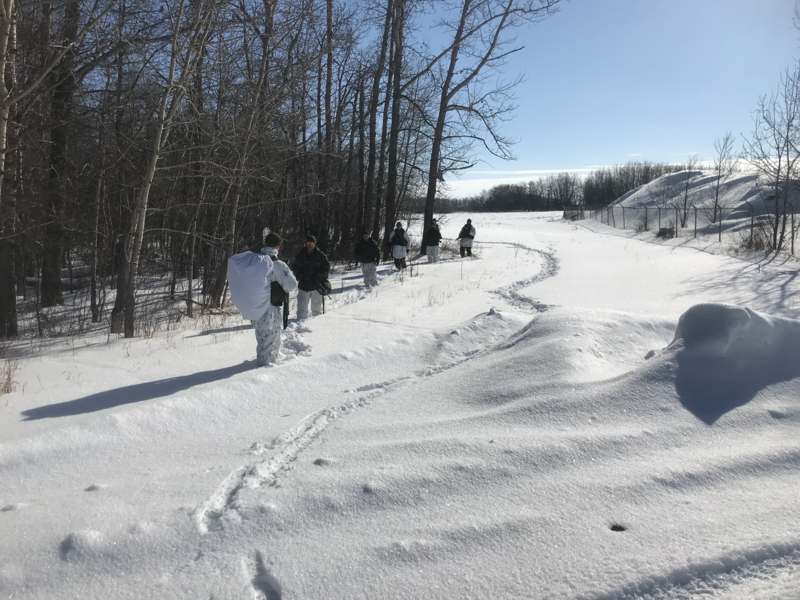 Over the weekend of March 8-10 the King’s Own Calgary Regiment along with its Developmental Period 1 (DP1) 0037 candidates participated in Kings Patrol in CFB Wainwright. 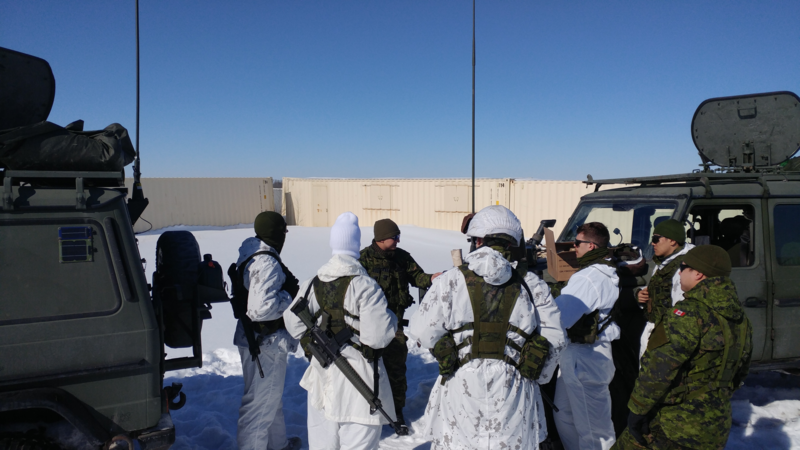 The main objective of Kings Patrol was to train the DP1 candidates in adopting “Hides and Harbours”, Running Replenishment, and the setting up and running of an observation post. A Hides or Harbours is a resting point for an armoured reconnaissance squadron that allows for concealment and rapid deployment. Running Replenishments are resupply for the squadron that is done quickly with little stopping. Observation posts are points where soldiers can remain hidden and monitor a specific target or area for activity. With the help from an advance party working through Friday, the regiment was able to leave Calgary for Wainwright by 20:00hrs. We arrived at our FOB (Forward Operating Base) at 01:30hrs where we immediately began preparing our tents and shortly thereafter went to ground for the night. The next morning started at 08:00hrs and after a quick breakfast the DP1 candidates and their instructors were in their G wagons to begin their training day. Training began with driving the G wagons on “black tracks” covered with up to a meter of snow in places. This made for excellent experience driving in less than perfect road conditions. It also afforded experience in recovering vehicles that had become temporarily stuck. Incorporated into the driving was practice on adopting “Hides and Harbours” as well as radio procedure. Adhering to radio procedure is important because it allows the relay of information in a timely and accurate manner. DP1 candidates benefitted greatly from the experience. Their confidence in their driving abilities greatly increased. By driving the vehicles while adopting a “hide and harbour” and participating in radio procedure previous classroom instruction was better understood when seen in actual practice. The afternoon instruction included a demo on how to select and adopt an observation post. This instruction focused on stealth, communication, and the gathering of complete and accurate information. After this exercise the vehicles were getting low on fuel and other supplies. It was time to practice how to set up and use a Running Replenishment. During a Running Replenishment, vehicles drive past other stationary vehicles that have the supplies ready to hand over. Fuel cans, boxes of food and other supplies are given to the passing trucks as they briefly stop to take on supplies. The Running Replenishment must be conducted quickly since many vehicles stopped in a small area makes an inviting target. After the Running Replenishment was completed, we headed back to the FOB for a hot meal before starting our next training assignment. It was dark by the time we set out again in our G Wagons, this time to establish and occupy an observation post for the night. 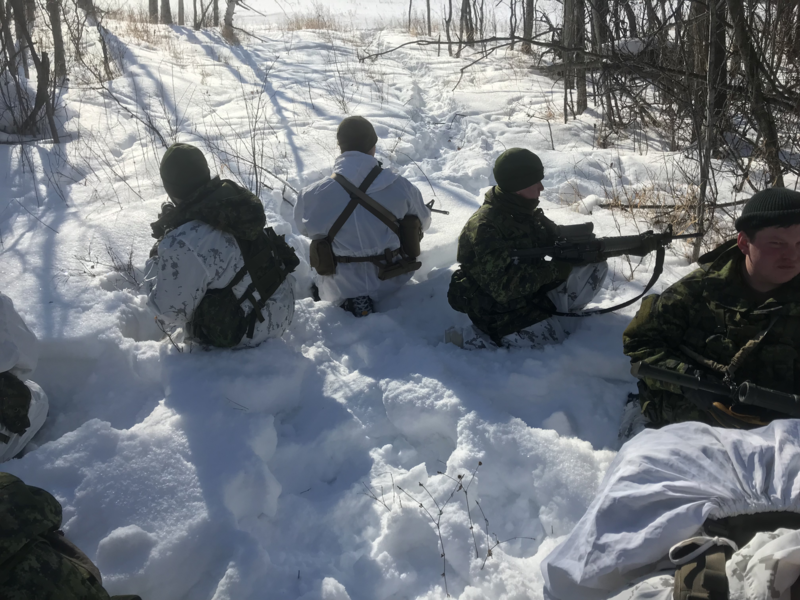 After driving to our OP base, 3 candidates and an instructor navigated through the dark and deep snow on foot to select a suitable position and establish an observation post. Once communications were established, two soldiers returned to the OP base. The position must provide adequate view of the target or area while the soldiers in the OP remain concealed. The rest of the patrol remained at the OP base to provide security and establish communications with the observation post. Each member of the patrol took turns manning the observation post in pairs throughout the night. 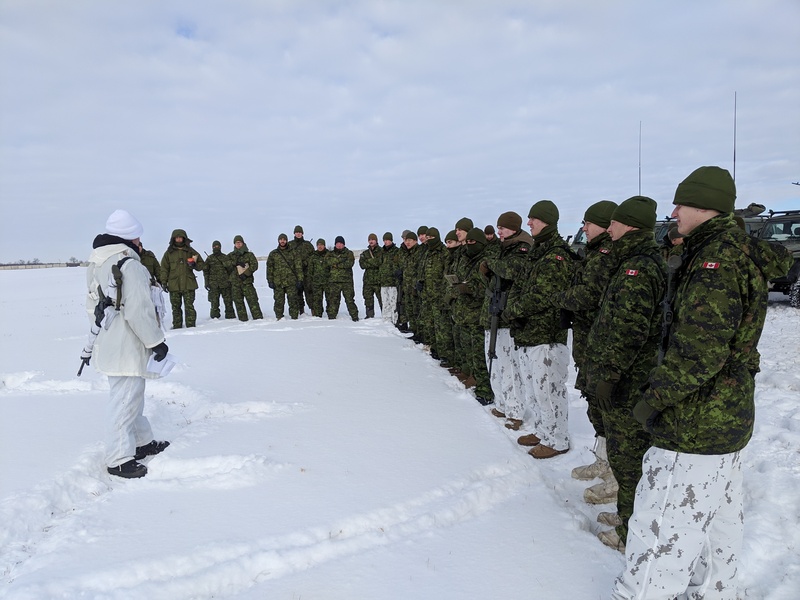 The lack of sleep and cold temperatures only served to increase our self confidence in our ability to work in inclement conditions and gain trust in the equipment and clothing the army provided. After a very cold, and what seemed a very long night, we packed up our OP base and returned to the FOB just after sunrise Sunday morning. Once we returned to the FOB we had a quick bite to eat and a debrief by the course staff. Before long we were on our way back to Calgary, arriving by mid afternoon. 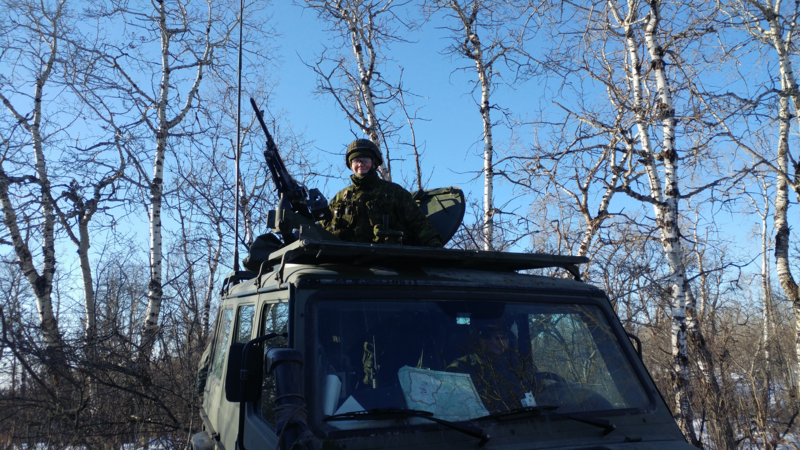 As an Armoured Reconnaissance Regiment our role is: “To provide timely and accurate information that both satisfies the commander’s information requirements and is received quickly enough to be incorporated into the commander’s operational planning process.” Every crewmember has an important part to play in this role and every team member must know how to do their job. The training received over this weekend is an important step on how to complete each role. As soldiers we understand how important this training is. The ability to do our individual tasks allows us to operate as a team and it takes a team to complete the mission.